IOS (Internetwork Operating System) is a multitasking operating system used on most Cisco routers and switches. IOS has a command-line interface with the predetermined number of multiple-word commands. This operating system is used to configure routing, switching, internetworking and other features supported by a Cisco device. 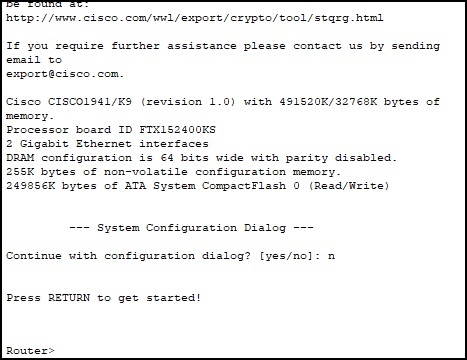 Previous versions of Cisco switches ran CatOS, a discounted version of a CLI-based operating sytem. 1. Console access – this type of access is usually used to configure newly acquired devices. These devices usually don’t have an IP address configured, and therefore can not be accessed through the network. Most of the Cisco devices have a physical console port. This port can be connected to a computer using a rollover cable, a special type of cable with pins on one end reversed on the other end of the cable. The rollover cable is a serial cable, which means that you can’t just plug it in an Ethernet port on your computer. You will need an adapter that converts an interface on your computer (usually a 9-pin serial interface) into RJ-45. 2. Telnet access – this type of access used to be a common way to access network devices. Telnet is an terminal emulation program that enables you to access IOS through the network and configure the device remotely. The device that is being configured needs to have an Telnet server installed and an IP address configured. Telnet uses a well known TCP port 23. One of the biggest disadvantages of this protocol is that is sends all data as clear-text, which includes the passwords! This is the reason why this type of access is usually not used anymore. Instead, SSH is usually used. 3. SSH access – like Telnet, this access type enables you to configure devices remotely, but it adds an extra layer of security by encrypting all communications using public-key cryptography. SSH uses well known TCP port 22. IOS has many different modes. There are three main modes any many submodes. We will describe the three main modes and one submode. user EXEC mode – the default mode for the IOS CLI. This is the mode that a user is placed in after accessing the IOS. Only basic commands (like ping or telnet) are available in this mode. privileged EXEC Mode – this mode is accessed by typing the enable command from the user EXEC mode. This mode can be password protected. In this mode a user can view and change a device’s configuration. global configuration mode – this mode can be accessed by typing the configure terminal command from the privileged EXEC mode. It is used to change the device’s configuration. A global configuration mode can have many submodes. For example, when a user wants to configure an interface, he will have to enter the interface submode by entering the interface INTERFACE_TYPE INTERFACE_NUMBER command (e.g. interface FastEthernet 0/1 ) from the global configuration mode. This submode can have many commands that are specific for the interface. Let’s describe each of the modes mentioned above in more detail.